The right pool slide can complete any swimming pool setup. It will add a touch of fun that people of all ages can enjoy. For many reasons, it is important that you get only the best pool slides. This guide will help you get the best slide for your swimming pool. Why get a pool slide? 1 Why get a pool slide? 4 What do you need to look for in a pool slide? 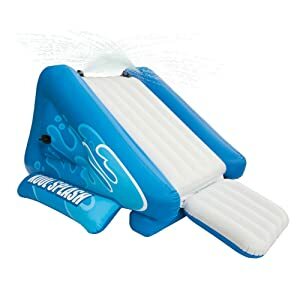 Many people consider the slide as one of the most basic swimming pool accessories. It can stand out on its own or it can complement other swimming pool goodies such as a pool basketball goal or a pool volleyball net. I’ve never seen anyone who loves swimming pools who doesn’t like a good water slide on the side. Water slides can be found in different shapes and sizes. They provide a wide range of thrills for swimmers. A basic and plain slide is more than good enough for most. There are bigger and wilder slides to choose from for those looking for something more extreme. Regardless of how you envision your dream pool, there is a slide that can match your vision. This pool slide is great for pool decks with limited space. This only measures 4-feet and 1-inch tall and has a 6-feet flume length. 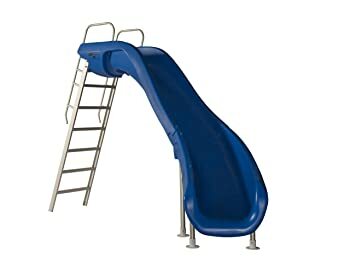 Though adults may not be thrilled to use this pool slide as it’s a bit too short for them, kids, however, will surely enjoy what the slide has to offer. It’s a compact pool with a space-saving design. The plastic material is rotomolded to make the slide sturdy and durable. The wide and deep flume allows sliders with bigger body structure to comfortably use the slide. The garden hose water delivery is a bit of a let down as it means that the water flow is not enough to make a good splash as you slide. Those who want a pool slide with a retro look will surely love having this Rogue 2 pool slide by S.R. Smith. 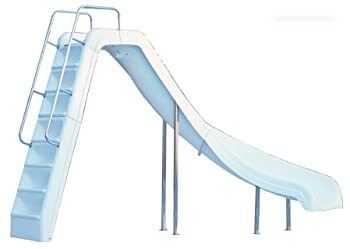 This is a right curve slide with a refreshing blue color. Although the entire look of the slide is retro, its material and construction are not. It makes use of modern flume that meets the safety standards. 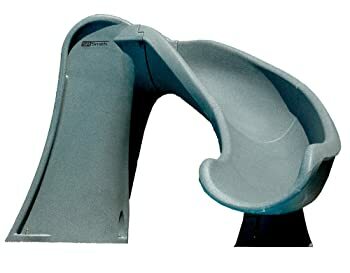 You’ll love the big splash you make as you slide in the flume since this slide has a high-volume water delivery system. The plastic flume underwent rotomolding for added strength and durability. Deliver approximately 30 gallons of water per minute. The stairs are not enclosed, making it risky for children. Want a wild ride in the slide? You’ll get it with this Inter-Fab Wild Ride Pool Slide. This pool slide has a right curve design and an elegant, modern look. It can accommodate sliders up to 250 pounds. Not only children will get to enjoy this slide, but adults can also have a great time sliding into its 11-feet long flume. Moreover, its white finish makes it easier for you to integrate it to your pool deck design. The slide has its own pump, which allows a high-volume water delivery system. Don’t use in above ground pools; this only works for in-ground pools. Another great pool slide from S.R. Smith is this Typhoon model. This, too, is built and designed with utmost safety in mind. 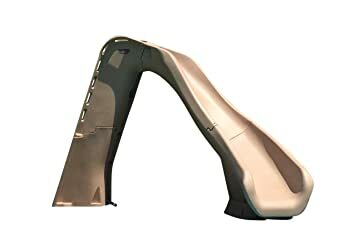 This is a left curve pool slide with premium material and wide flume space. If you want a pool slide from S.R. Smith with a wide and deep flume, then this is the right product for you. The rotomolded plastic enhances the slide’s construction, making it sturdier. Assembly of this slide can be a challenge. Make sure all sections and screws are lined up well. If the right curve and left curve pool slides aren’t enough to make you enjoy the most of your slide experience, then try this Helix 2 model from S.R. Smith instead. This pool slide is an all-in-one 360-degree slide with a total flume length of 12 inches. Just like most of the pool slides from the brand, you can guarantee that it is safe to use. This does not include a water pump. This inflatable pool slide will bring a new twist to your slide experience. Being an inflatable slide, you can easily uninstall and store it when not in use. You can even bring it to another pool as long as the dimensions are just right. This is designed to give maximum enjoyment for the children in any occasion. For the safety of everyone who will use the swimming pool, there are some requirements that must be followed when installing a water slide. The first thing you must check is if the local codes will allow you to build a pool slide. If they allow the setting up of slides, you need to check the laws regarding this, and you should follow them to the book. One other requirement you should look at is the area the slide will occupy. This the amount of space needed to properly install the slide. In general, the bigger the slide, the larger the area it needs. You should check the space that the slide needs. Compare it to the amount of space in your poolside to find out if it’s the right slide for you. The water supply is another important aspect of installing a pool slide. Water is needed to lubricate the slide, so this is an important factor in the process. There are 2 common ways to get around this. You can install a water system connected to the pool that will push the water from the pool into the slide. On the other hand, the system used to fill up the pool can be sent into the slide. 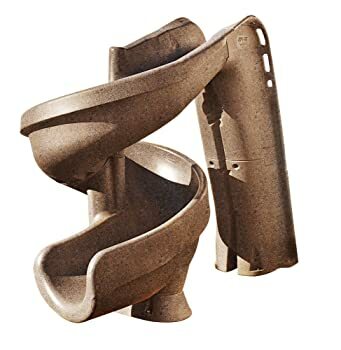 What do you need to look for in a pool slide? When in the market for a pool slide, you should consider the people who will use it. If you want the slides to be used only by children, then you can install slides that are designed for kids. However, if you expect full-sized adults to use the slide, you should get something that caters to adults. Aside from having enough width to fit an adult, the slide must have at least 200 to 300 pounds of weight capacity. You should also check out the pool stairs. The pool ladder is an important part of any slide. It can greatly affect its safety level. Getting a slide with an enclosed stairway is a better option for slides that will be used by children. Also, you must make sure that the steps have enough traction even when wet. Slipping on ladders is one of the most common causes of slide-related injuries. Thus, it must be given enough attention. Lastly, you should consider what slide makers refer to as the “water safety envelope”. The envelope includes the required depth of the water at the end of the slide. This usually ranges from 3.5 to 5 feet. The amount of overhang needed from the edge of the pool, and the amount of clearance the slide needs relative to the pool are also important. Each slide has its own unique water safety envelope, and it should work within the dimensions of your slide. It would be great for you if the seller would deliver the slide after the purchase. After all, there are lots of running parts in a slide kit. It can be tricky to carry everything from the store to your home. Most sellers offer free shipping to your house, so that’s a major relief on your part. Most of the slides you can find on the market can be built DIY-style. Given this, you would want to get a slide that can be properly built even by beginners. The instructions should be explained in a simple yet detailed manner to avoid construction accidents. It would also be helpful if the set up requires only a few tools and equipment. You should also consider any potential changes you must make both to your pool and the poolside area. With all things considered, the clear winner in this review is the SR Smith Pool Slide. Sure, it costs more than the other products mentioned in this review (the Inter-Fab and the Intex), but paying a little extra for the product is sure to be worth it. It is a slide that can be used by both kids and adults. Its length and curves provide more thrills than others, and the water pump provides ample water for optimal speed. The SR Smith Pool Slide belongs in the list of the best pool slides because it has the features that every buyer should look for in a slide. It passes the latest durability and safety standards. It has enough length and a great design to appeal to both young and old. It is also easy to install and has a user guide that’s simple to follow. As a bonus, its many color options help you choose the finish that is best suited for your pool’s design.